Most of us probably take the kitchen refrigerator for granted. You plug it in and it keeps your food chilled and safe to eat for several days while the freezer keeps food safe to eat for a long while. Turn the clock back to the 19th Century and even up to the 1940’s in some cases, and keeping food chilled wasn’t so easy. Ice harvesting was a big business in my hometown of Lake Geneva, Wisconsin, as it was for any municipality that had access to frozen lakes and rivers. 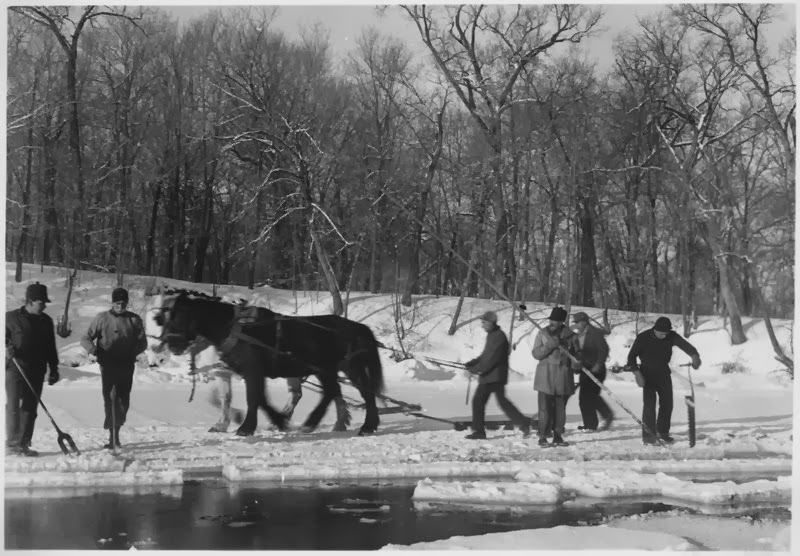 For the three or four months a year, while the lake was frozen, men were provided employment as they worked hours to get large blocks of ice harvested and stored for the coming summer months. While researching for my historical novels, I actually came across old advertisements from Chicago restaurants that stated they chilled their drinks with crystal-clear ice from Lake Geneva. Ice cutting and harvesting on a larger scale than my small hometown had been done for decades on the East coast, but as populations moved westward, so did the ice industry. Not only was ice needed for homes, but also commercially to chill the meat being transported from the Chicago meat packing companies to the East. To safely cut and harvest ice, the ice had to be at least 12 inches thick. First, they scored the iced using a tool that looked something like a plow with a long blade. A horse pulled the tool back and forth, scoring the ice into even-sized squares. Next, men would saw the ice on three sides of each square then, using a special tool that looked like a long pole, they’d break the fourth side away. Then they prodded the floating blocks of ice through an open water channel to a ramp, and a horse pulled each block of ice up the ramp where it was loaded on a wagon. A horse team pulled the wagon to the ice house. In my hometown’s case, it was stored near the railroad depot for ease in getting a lot of the ice onto train cars to take into Chicago. The rest was used in town and delivered to homes. Here's a film from 1919 that actually shows the process from beginning to end. If you have time to watch the whole thing, it's fascinating to watch. The blocks were stored with layers of hay and sawdust in between them. Amazingly, it would keep until summer. Ice was regularly delivered to homes much the same way milk was delivered. For home deliveries, if customers needed a delivery they’d put a sign in their window that said “ICE,” followed by the amount of pounds needed. 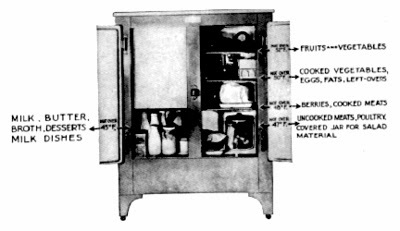 The need for ice delivery slowly dwindled as people began acquiring electric refrigerators during the 1930s. Today ice harvesting still goes on, but mostly for educational purposes to show those of us who have always taken our refrigerators for granted how most people kept their food cold as recent as 80 years ago. A native of Lake Geneva, Wisconsin, author Pamela S. Meyers lives in suburban Chicago, an hour's drive away from her hometown which she visits often to dig into its historical legacy. Her novels include Thyme for Love, and Love Will Find a Way, contemporary romantic mysteries and her 1933 historical romance, Love Finds You in Lake Geneva,Wisconsin, released in April, 2013. She can often be found speaking at events around Lake Geneva or nosing in microfilms and historical records about Wisconsin and other Midwestern spots for new story ideas. Very interesting post. Thank you for sharing. Hi Pamela, wish I had read your post six months ago when I was researching my latest book. It would have saved me tons of work. Great stuff! Great post, Pam. Like Margaret, this would have saved some research last year. :) Making sure I save this. Thanks. I enjoyed your posted movie of ice harvesting.We are so accustomed to refrigeration, we forget what came before it! Thanks for your post. Lake Geneva, WI is a beautiful place. Hi Pam! Thanks for a great post! I love to read historical fiction but many times I have wondered about the old ways of making ice or just how people kept cool long ago - especially the women in their many layers of dress. Of course, since I'm already heat sensitive due to my having MS, and I live in Oklahoma where our winters seem to only last a month or two-until this winter, that is-then I've been getting full blown hot flashes for the last 3 yrs that sometimes literally last for hours upon hours and I'm placing refreezable gel ice packs strategically around my person I definitely do not take my trusty GE freezer for granted and I praise God that he placed me in the perfect era because He totally knew I was going to need central air conditioning in my home and car! !